Two sets of 13 elementary questions that can be used to practise or reinforce basic verb tenses (be/do). 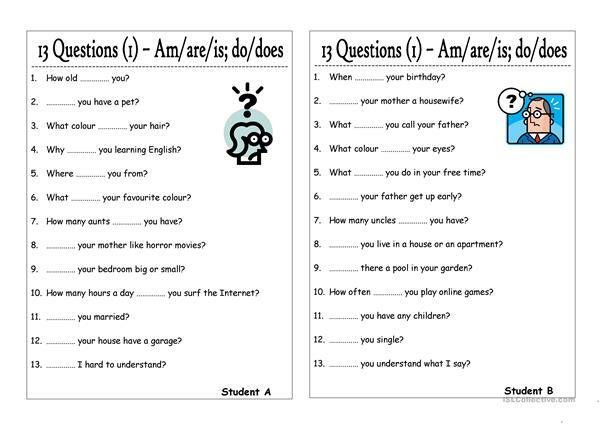 Give students some time to prepare and then let them practise in pairs. They should not show each other their questions; this doubles as a listening exercises. Encourage students to answer the questions as well as they can. Follow-up questions should be encouraged. This worksheet focuses on personal information. Enjoy. The present downloadable teaching material is intended for high school students, elementary school students and adults at Beginner (pre-A1), Elementary (A1) and Pre-intermediate (A2) level. It is a useful material for practising Questions in English, and is excellent for enhancing your groups' Listening and Speaking skills. The solutions are provided, too.